Madison police officers said goodbye to one of their own Wednesday, May 22, 2013, as the department held a visitation for Sergeant Karen Krahn. Sergeant Krahn passed away peacefully on Sunday, May 19, 2013, after a lengthy battle with cancer. While she was in hospice, the Madison Police Department (MPD) presented Sergeant Krahn with the department’s first Courageous Service Award, which was created in her honor. Pictured on the right is Madison Mounted patrol horse, Bubba, visiting Sergeant Krahn at Agrace HospiceCare. Sergeant Krahn had a special bond with both the MPD Mounted Patrol and K-9 units. Her bond with the animals did not end with her passing. Members of the K-9 unit paid their respects at her visitation, and horses with the Mounted Patrol were present at her funeral. Sergeant Krahn’s wish was that if anyone wanted to make a donation in her memory, that they contribute to Capital K9s and Madison Mounted. 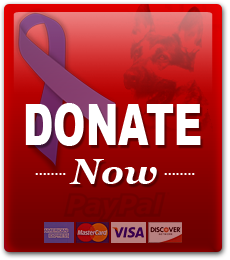 Click on the red “DONATE Now” button to the right.